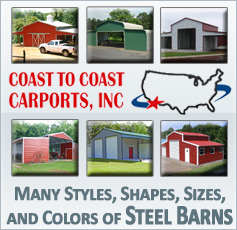 Coast To Coast Carports, Inc. produces some of the finest barn steel buildings. Each building is made with precision and care to make sure that it will become exactly what you are looking for in a barn. Farmers want to be able to find the barn that will take care of their unique needs. Our barns come in all different shapes and sizes. You can pick out one of our great currently offered options, or completely customize your own building. The choice is up to you, but we have confidence that you will be satisfied with any Coast To Coast building that you choose to buy. There is a reason why we only make our barn steel buildings, and other agricultural buildings, out of steel. Steel is far more durable, and will last significantly longer than other building materials. With little upkeep required on your part, your building will always look well maintained on both the inside and outside. The most important part, though, is that your building from Coast To Coast will give superior protection to your livestock. We pride ourselves in giving our customers exactly what they need in a barn. 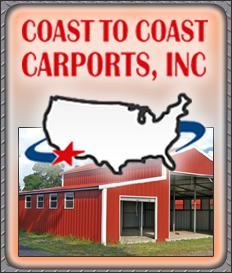 Coast To Coast has been serving customers for over twenty years, and has now grown throughout the entire US. The reason why we are so successful is that our complete focus is on making sure that our customers are happy. After you place your order, you can expect your building to be assembled and shipped to you within 2-4 weeks. From there, our experienced crew will swiftly install the barn at your chosen location. If at any later time you have a question or concern about your steel building barn purchase, we will be more than happy to help you. Once you experience barn steel buildings, built by Coast To Coast, you will wish you heard of us sooner.